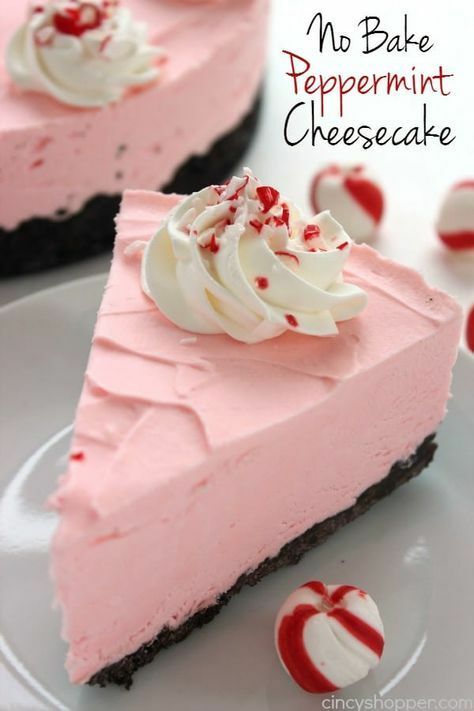 We have quite a few Christmas parties this year and this No Bake Peppermint Cheesecake has officially made the list of needing to make a couple of times. The combination of the chocolate Oreo crust with the pepperminty cheesecake was so perfect. I garnished this cheesecake with small dollops of whipped topping, a few crushed candy canes and also some of the peppermint pillow candies. I think the additions dressed up the cheesecake but were not needed. The cheesecake is perfect all by itself. Crush Oreos in food processor and add melted butter and sugar. Press mixture into bottom and partway up sides of springform pan. Refrigerate at least 30 minutes to firm. Beat cream cheese and sugar until well mixed. Set aside. Whip heavy cream and powder sugar until stiff peaks form. Fold and blend cream cheese mixture into whipped cream mixture. Add food coloring and peppermint into filling mixture. Refrigerate for at least 4 hours or until firm. You can garnish with dollops of whipped topping and crushed peppermints if desired.